In the ongoing tradition of boxing films, the scorecards have always been mixed. They're either a knockout sensation at the box office or a complete flop. "Creed" falls somewhere in the middle. The seventh installment of the Rocky series follows Adonis Johnson, the illegitimate son of Apollo Creed, who is seeking glory in the ring and an identity in life. Johnson, played by break-out star Michael B. Jordan from 2013's creeper hit Fruitvale Station, has a checked past between struggle and privilege. Spending his youth fighting in between juvenile detention centers and group homes, the young Adonis is finally adopted by his late-father's widow, Mary Anne Creed, and is from there secured into a life of relative privilege and affluence. We quickly learn, however, that Adonis is fighting for something beyond earning dollars in the ring. Thus, the stage for the story is set early. Johnson is a self-trained nobody who has compiled the entirety of his ring experience in underground bouts in Mexico. After being unable to secure a training ground in his native LA, he travels to Philadelphia to seek tutelage from none other than Rocky Balboa, his father's greatest rival and best friend. Much of that choice is also driven by a decision to understand his past. Balboa, played of course by Sylvester Stallone, waivers back and forth before finally agreeing to reenter the boxing world and takes Adonis completely under his wing. There is of course a love interest Bianca, played by Tessa Thompson, who serves as the protagonist's muse as Adrien did for Balboa. All the pertinent hero-cycle elements are therefore in place; Johnson has the call to action, the mentor, the love interest, and the final dragon to slay, which in his case, is winning the light heavyweight championship of the world. How that story unfolds, however, is mixed. First, let's talk about the downsides of the film. From a pure cinematic perspective, the storyline is predictable and unrealistic. There are a few eye-rolling moments that make you want to walk out of the theatre at how contrived and forced the lines are delivered. The moment when Bianca shows up at his hotel room for his championship fight in the UK, for instance, is one of them. To the film's credit, there are one-liners that make you nearly tear-up, and the timing of their delivery is cinematic mastery at their best. Unfortunately, they are few and far between. Next, the rise of Adonis Creed (Johnson later changes his last name for promotional purposes) would likely never happen in the real world. The idea of the young Creed composing a 15-0 ledger in the underground boxing circuit of Tijuana is difficult to believe, and to somehow land a title shot against the film's champion and number one pound-for-pound fighter in his second bout on American soil, is virtually impossible. The managerial and contractual obstacles alone would make that a nightmare, and in terms of capturing the business side of boxing, "Creed" is fantastical at best. But putting aside the inaccuracies of the inner-workings of the boxing world, capturing the actual feeling of entering the ring and taking punches is second to none. The camera angles chosen by director Ryan Coogler are downright astounding. This should be the standard for shooting boxing films and if fights could somehow be filmed that way, it should be implemented. Adonis's ring walk in the final fight is probably the most immersive experience I've ever had in a movie theater. The action during the fights feels the same way. When a fighter gets punched, you feel like you've been punched; the same feeling applies when anyone is knockdown or out in the film. The other plus that Creed accurately captures are the training montages, which per Rocky tradition were realistic and inspiring to watch. One gets an intimate look at a young man finding himself through hard work, sacrifice and dedication to becoming a competent fighter. 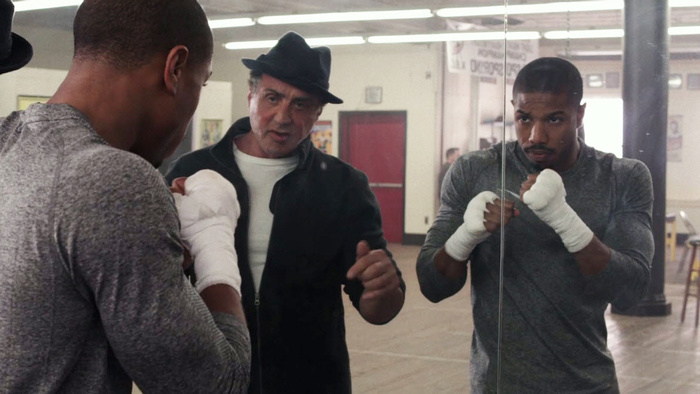 There is certainly some work that can be done on the script, storyline, and real-world accuracy, but in terms of recreating the boxing atmosphere, Creed holds its own. It features pugilistic familiars like Jim Lampley, Max Kellerman, and even a stellar cameo appearance from Andre Ward. While not a perfect depiction of the boxing world, it does bring a certain humanity to a sport that far too few people actually know about. Overall, "Creed" is a story about a young man trying to find his own identity from underneath his father's shadow. It is a classic Greek plot line that manages to seep analogously into any scenario to help us relate to the struggle in one way or another. In that sense, Creed does a good job. So if you like inspirational tale of comeback embedded in the boxing world, Creed is worth checking out.